Roboworm is the creator of the original Zipper Worms, one of the most copied baits in history. 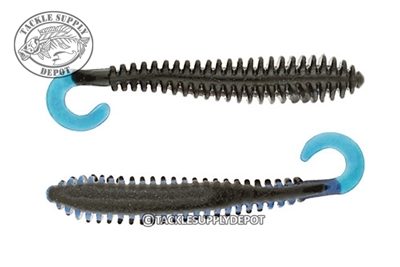 The prominent ribs along the length of the Roboworm Zipper Worm, provide many benefits. Aside from giving the bait a bulkier appearance, the ribs displace a significant amount of water, creating a big disturbance, and attracting bass from greater distances. The ribs also give the Zipper Worms a feel and texture that bass love, causing them to hold on longer for better hooksets. The whole line-up of Zippers include Roboworm's Salt Release Technology which releases a burst of salt when a fish strikes, causing the fish to hold onto the bait longer for increased hook ups.